1 of 4 Heat oven to 350 degrees F. Line jelly-roll pan with waxed paper. Lightly coat with cooking spray. 2 of 4 Combine flour, baking powder, baking soda and salt in a bowl. 3 of 4 Beat together butter and sugar in medium-size bowl until smooth and creamy. Add egg whites and vanilla; beat until fluffy. On low speed, alternately beat in flour mixture and buttermilk in 3 additions. Spread evenly in prepared pan. 4 of 4 Bake in 350 degrees F oven 25 minutes or until cake springs back in center when lightly pressed with finger. Cool cake in pan on wire rack 10 minutes. Remove cake from pan to rack to cool 15 minutes; carefully peel off waxed paper. Trim sides of cake. Cut out sixteen 2-3/4-inch rounds, using biscuit cutter. 1 of 3 Beat butter on medium speed in small bowl until creamy. Add confectioners sugar, salt, water, vanilla and lemon extracts; beat until mixture is very smooth and creamy. 2 of 3 Sandwich cake rounds in pairs, using 1 tablespoon frosting for each pair, making a total of 8 drums. Place cakes in freezer for at least 45 minutes or until firm enough for easy frosting. 3 of 3 Frost tops and sides of chilled cakes. (Cakes can be made up to this point several weeks ahead. Wrap in plastic wrap, then in aluminum foil; freeze. Thaw overnight in refrigerator.) 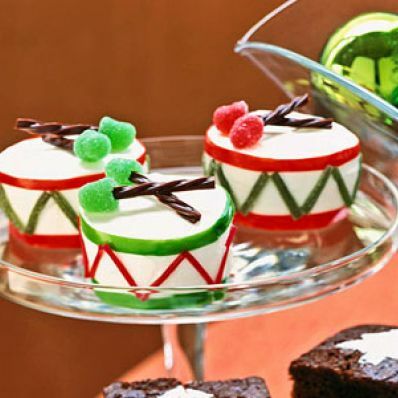 Decorate with fruit leather, licorice, gumdrops and strips as pictured. (Can be decorated a day ahead and refrigerated.) Refrigerate until serving. Per Serving: 89 mg chol., 21 g sat. fat, 656 kcal cal., 1 g fiber, 298 mg sodium, 33 g Fat, total, 3 g pro., 89 g carb.